You are the personal outlet and not anything else. 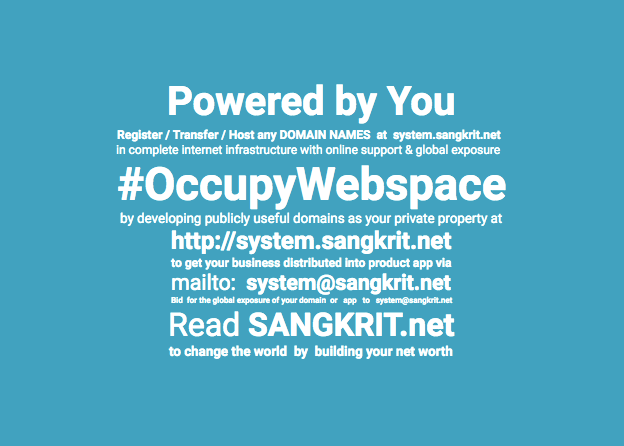 When you do signup for your free SANGKRIT.net account for both- business and personal, you become a personal outlet of the globally distributed order of Sangkrit. The personal outlet of the globally distributed order of Sangkrit is to keep you free forever. Neither you ever get victimized of any wage slavery nor you do victimize anyone else. This is the movement. So you should not become a shopkeeper by exploiting others to work for you. Contrarily you ought to transport humankind into internet age by unburdening them of any outdated era. Sangkrit is a collaborative measure so you may seek all necessary cooperation in your business from other personal outlets such as yours. In any case you own your world to make a world revolution. The quantum mechanics involved here work like this. Every move denotes a purpose. You do nothing unnecessary, nowhere, never. That is the fundamental principle following what makes you a hero of internet age. You do have to lead this course for others as well. You do regularly cleanup your place, make your meals, program your world and blog your mind to take on an outgoing world. Doing all that you emerge as the hero of internet age. You may be working on the go as independent humankind, meeting clients in the coffee shops of five star hotels whenever necessary and accepting payments direct in your personal bank account. You are the personal outlet and not anything else.